Keep your guard up! In Schlock Mercenary: Capital Offensive, you never know what the enemy may hit you with. Plasma shotguns, laser sniper rifles and nuclear epaulet grenades are all weapons of choice in this multiplayer tactical shooter. You even have to fear being stomped, subpoenaed and snacked upon. 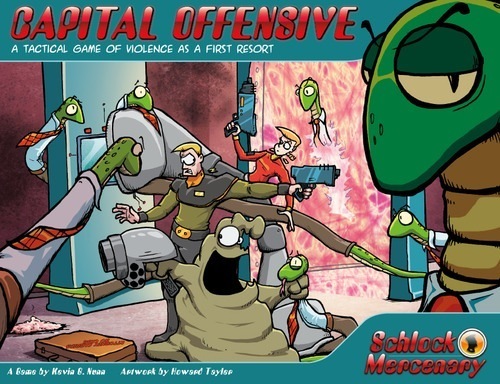 Based on the award winning Schlock Mercenary webcomic, Capital Offensive puts you in the shoes of both Tagon’s Toughs, a mercenary group made up of exotic aliens, and the Partnership Collective Drones, a vast group of cloned attorney snakes. Six different scenarios are included with the main set allowing players to enjoy different tactics and elements of the game. From the “knock everyone around” scenario to the “Locate the objective and return it to your ship” scenario, Capital Offensive has something for every play style. Ships from our warehouse in 7 to 23 business days. Sign in to start a discussion about Schlock Mercenary: Capital Offensive!